Includes four black powder coated steel wall mount brackets. Bowed front. Made in USA. Raised panel design. Pronounced crown molding detail. Built-in overflow drains. Sub-irrigation water system. Encourages root growth. 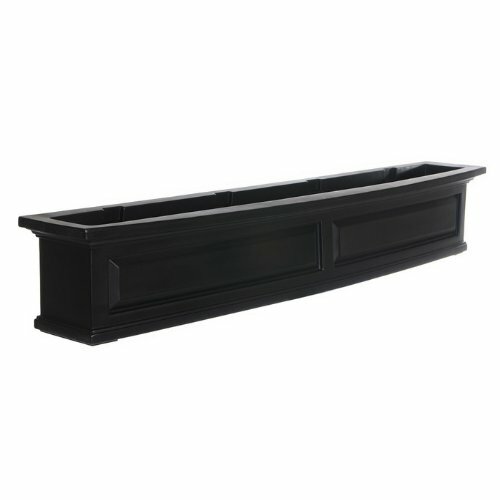 Holds 6.5 gallons soil. 4.5 gallons water reservoir capacity. Warranty: 15 years limited. Made from high-grade polyethylene. Made in USA. Inside: 55 in. W x 8 in. W x 7.5 in. H. Outside: 60 in. W x 11.5 in. D x 10 in. H (15.5 lbs.). Assembly Instruction. Please be sure to install one deck rail bracket (not included) for each wall mount bracket. These 2 brackets work together to provide stability and evenly distribute the weight of your planter, potting mix, and water. Please note that this 5 foot window box requires 4 brackets.